Sorry, still no camera cable but some instead you'll learn about the dispute over the name Macedonia! Macedonia, the country from which I'm reporting, is not officially Macedonia. Or not just Macedonia. The official name is the Republic of Macedonia. 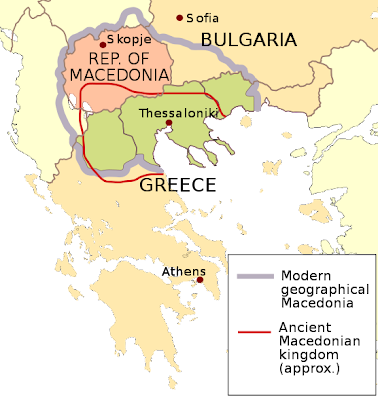 Its southern neighbor Greece will not let Macedonia be simply that because the official name for a region bordering (the Republic of) Macedonia in northern Greece IS Macedonia and has ties to that name since Alexander the Great ruled. (From now on when I say Macedonia I'm referring to the country I'm in). According to an ethnic Macedonian we talked to Greece claims Macedonia has political ambitions to take this northern part of Greece, which he admitted was crazy so maybe there's some Macedonian exaggeration attached. Adding to this confusion is Macedonia's name when admitted to the UN. Thanks to this dispute Greece wouldn't allow Macedonia to enter as anything but "the former Yugoslav Republic of Macedonia", sometimes abbreviated as FYROM. There are 131 countries (more than 2/3 of the United Nations) that recognize Macedonia as the Republic of Macedonia as of January 18th, 2011 but others still stick with this longer name. To me it seems like a de jure/de facto thing -- officially it's "the Republic of", actually it's simply "Macedonia" -- but it really is a political issue, one that has held up its EU accession (its poor production and growth and corruption also weigh in as well but I'll try to attack those in a later post). In three weeks time there will be the 1st litigation in the International Court of Justice located in The Hague in Netherlands. In 2008 Macedonia sued Greece for "flagrant violation" of Greece's obligations from the 1995 Interim Accord. This 16-year-old Accord basically promised "continuing negotiations" between the countries and to avoid the awkwardness of naming the countries in the Accord, it referred to Greece as "the Party of the First Part having its capital at Athens" and Macedonia as "the Party of the Second Part having its capital at Skopje". Greece has fired back saying that Macedonia has been uncooperative and "is not interested in a solution" and also that Macedonia has "flagrantly violated a series of fundamental obligations expressly foreseen by the Accord, including the fundamental principle of good neighborly relations." Bam. They are on unfriendly terms. * The constitutional name, in Cyrillic ("Република Македонија") could be used for internal purposes. * "Republic of Macedonia (Skopje)" would be used for international relations. * For bilateral relations, "Republic of Macedonia (Skopje)" is suggested, and any countries using the state's constitutional name would be encouraged to use it, but not forced to change it. There's probably a lot more that can be said about it but that's what I've picked up and am passing onto you! In a couple hours were going to Matka Canyon and I'll post some pictures from there and everywhere else we've been as soon as I can. Sorry I've been absent a little. As always, I enjoy your writing: you know how to make smart stuff really interesting and entertaining.